This herringbone wool blanket is custom woven with our small farm wool. A lot of personal touch and caring artisans have created these blankets, from the farms in Indiana, to the spinners in Minnesota, to the weaver and finisher in Massachusetts and finally to our sewing room in Minnesota. 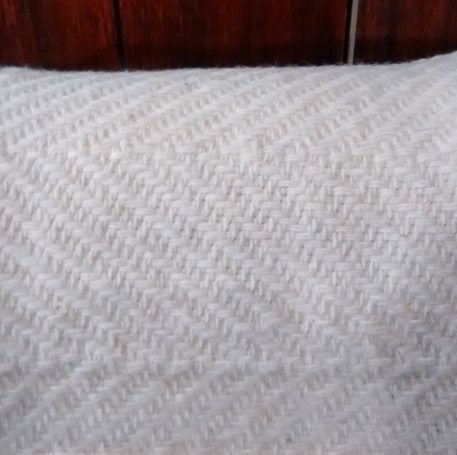 Everyone who touched this wool said how beautiful it was and what good quality it boasted. By purchasing a blanket, you will not only will you be purchasing consciously raised wool and supporting quite a few small businesses, you will be enjoying an heirloom wool blanket worth showing off. A wool blanket is the perfect medium warmth between a sheet and a wool comforter. 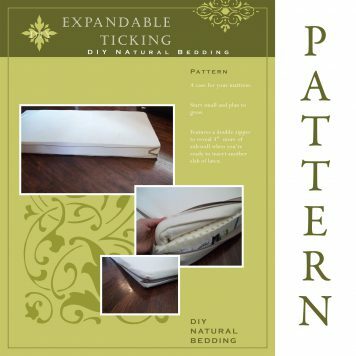 The fabric is flexible and not as heavy as a cotton blanket, though it is comfortably warmer. If you are trying to get wool close to your skin to let its temperature regulating abilities be effective, a wool blanket brings the wool even closer than in our Quilted Ticking. This wool is untreated wool. Hand wash with a gentle soap and lukewarm water. See Care Tab for more details. 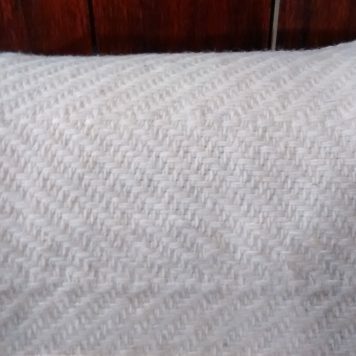 This blanket fabric is the same fabric as our Wool Blanket, it is simply sold with raw edges that you will want to hem or bind to keep from fraying. 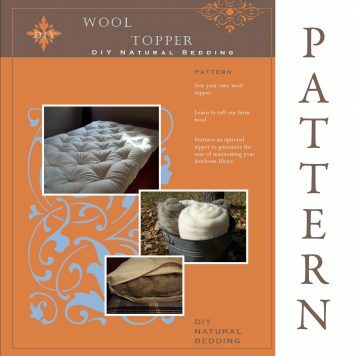 While the cost of this product is mostly in the wool itself, you do save yourself the labor costs of hemming and seaming. To see the finished product, click here. Trim down the fabric to your preferred size. The sizes below allow for hems/seams compared to the completed blanket. To make a Full, Queen, King blanket, seam two pieces together down the middle perhaps as we do with a felled seam. Hem or bind the edges. There is 10 ounces of wool per square yard of blanket. If you desire more softness than the wool blanket provides, you may lanolize your blanket. This is not a necessary step. You will find lanolin in most box stores in the baby bottle aisle. Lanolin is also known as wool wax. 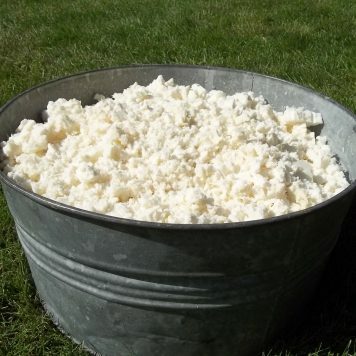 It is the oil the sheep produces to water proof its fibers while it is wearing them. The washing of the wool removes the lanolin along will the vegetation and dirt. It is not commercially possible to leave the lanolin on the wool, however some factories do salvage the lanolin at the expense of the wool. We can join them happily together again, both in their clean state. Before bedtime or sometime when the bathtub will be free for quite a few hours, fill a bowl with hot water or a jar with a lid. Add in 1-3 tablespoons of lanolin and stir or shake until the water gets cloudy or the lanolin dissolves. You may add in some wool appropriate soap to help the process along. Fill your bathtub (preferably not your washing machine tub), with tepid water. Soak your puddle pad in the tub. This project is easiest with more water rather than less water. Throw in a little wool wash to increase the absorbency of the blanket. When the lanolin water is the same temperature as the tub water, pour it in and swish it around. Make sure the water gets inbetween the folds of fabric. Squeeze out extra water and let the spin cycle of your washing machine wring the rest out. Lay flat or line dry. Should your wool blanket become soiled and need to be washed, you may HAND WASH it gently. Vinegar or hydrogen peroxide may also be used for sanitizing or spot cleaning. Shrinking is caused in part by the rubbing of the fibers against each other. As the fibers are rubbed against each other, they intertwine, shortening the length of the wool fiber. Avoid agitating the wool. Avoid using soap unless necessary. Strong soaps will raise the PH of the wool and cause it to felt easily. Drastic heat changes in the water will also cause the wool to felt. Let your blanket float, submerged in a tub full of tepid water. Push it down and around until no bubbles appear. Let it sit. As it sits, you will see the dust being released and floating on the surface of the water. If you choose to choose a soap, use a gentle wool soap such as Eucalan. Drain water and fill again if rinse is desired. 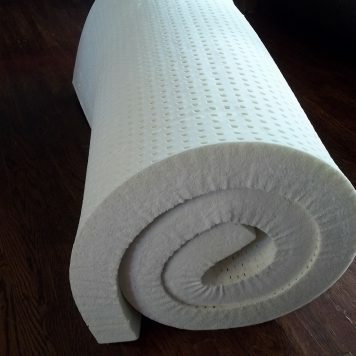 Drain water and press out the extra water in the comforter. You may use the centrifugal force of the spin cycle in your washing machine to wring extra water out. Hang up or ideally lay flat to dry in the sun to dry. Sunlight is a natural sanitizer. Do not use an automatic dryer as it will mat the wool. 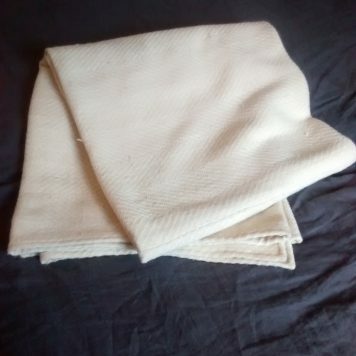 After it has dried for a day or so, you should have a fresh smelling, soft wool blanket, ready to use.